What we need is a device which can be program without a computer and it should be portable, small and multipurpose. Also it should work with 5Volt. I used series of external eeproms(up to 8). So, I can use multiple programs on each eeprom. Program used in PIC Micro controller is a Virtual Machine. It reads two byte (one for operation code and one for value) from eeprom and executes it. Then move to next two byte. 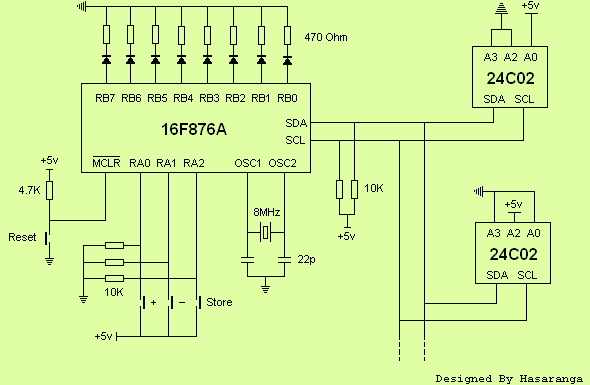 Output of this circuit is 8 LED indicators which are connected to PORTB of micro controller. You can use them to do whatever you want. When programming, write the instructions on paper, translate it to 1 and 0. Enter it using switches. And BOOM!!! There are many embedded virtual machines for micro controllers on the internet. But they were not designed to program by hand. That’s why I used my own type of virtual machine. Following image is the implementation of the device. It consist two eeprom which is enough for now. Virtual machine was coded using C language to get some degree of portability. You’ll have to change device initialization code if you are using different type of micro controller. I used “mikroC Pro for PIC” compiler to build the hex file. Maximum address space is 256 since address size is 8 bits. No function call support since absence of stack implementation. Take a paper and write down the program using operation codes with their addresses. Translate those operation codes & values to binary using instruction set table. Now you have assembled program. Let’s enter it to the device! Power on the device, hold Store button and press Reset button. LEDs will blink to indicate that you are in programming mode. Select the eeprom by using + or – button and press Store button. Now LEDs will turn off and you are ready enter the program. Use + or – button to get desired binary pattern and then press Store. Do the same for second part and press Store. 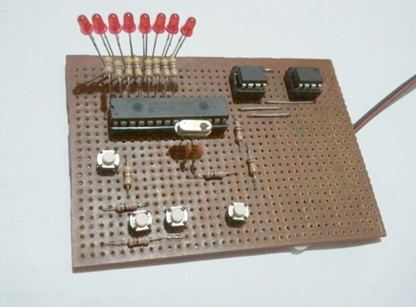 LEDs will blink to indicate that data is writing to the eeprom. Do the same procedure for all bytes in your program. You can have access to entire ports of micro controller if you use separate circuit to program eeproms. You can speed up the virtual machine by using assembly code instead of C.
You are currently browsing the Tools & Technologies From Hasaranga blog archives for February, 2013.